Heat 1 tablespoon of the oil in small skillet over medium heat and cook garlic for 30 seconds. Stirring constantly. Remove from heat and set aside. 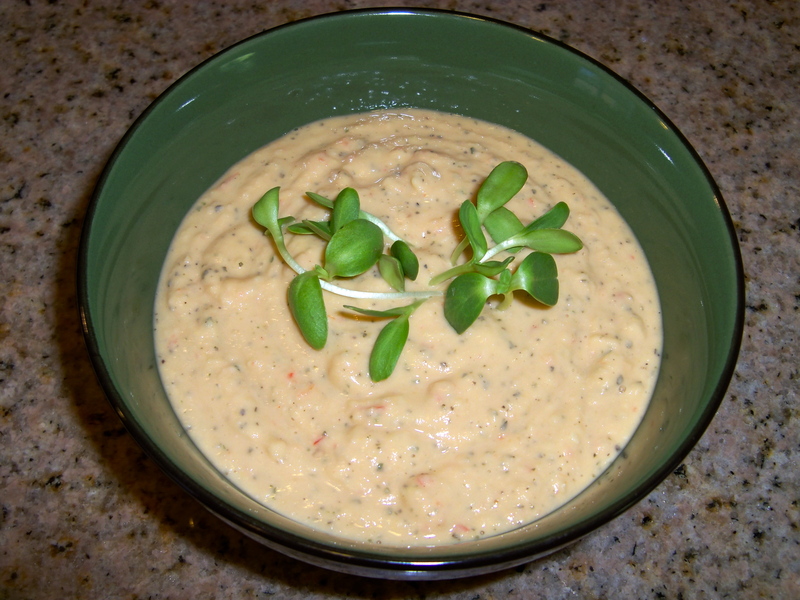 Place garbanzo beans in a blender or food processor with 1 teaspoon of purified water. Blend until smooth. Mix in sauteed garlic, sesame seeds, tomatoes, red bell pepper, lemon juice, other tablespoon of olive oil, sea salt and pepper. Process to desired consistency. To make creamier you may need to add more purified water to liking. Chill in refrigerator. Top with sunflower sprouts. Great as a dip, on sandwiches with pita bread as a dip and so much more. Use as a spread for bread, to top quinoa and more. I love hummus but am tired of my usual recipe so this is perfect! The only thing I worry about is it going bad before I can finish it all (on account of all the fresh veggies in there). Any idea how long it’ll keep in the fridge for before going funky? It looks great! It usually lasts 1-2 weeks. If you use less ripe fruit not the over ripe that you would ordinarily pick like the bright red tomato,but get like an almost bright firm tomato it makes it fresh longer, not perishing until the veggie would. It also freezes well. I usually make it and then separate it into two sealed containers. One I keep in the fridge and I pour a bit of olive oil on top it keeps it fresher longer. The other I store in the freezer and you can pull it out thaw it and eat it, having hummus anytime that is fresh and at your finger tips. If you use it regularly you also wont have to worry about it going bad. I put it on sandwiches like a dip or sauce and its delicious. Be sure to try this recipe it is really good if you enjoy hummus. Thanks so much for visiting. I am going to visit your page as well. Take care. Wishing you great love, health and abundant happiness. Thanks for the tips! Can’t wait to try it out!